Malaysia maintains a big lounge at KLIA (Kuala Lumpur International Airport) in the International Terminal and the Domestic Terminal. Additionally there are lounges at Johor Bahru, Kuching, Kota, Kinabalu, Penang, and Langkawi. Internationally, Malaysia has a lounge at London Heathrow (LHR, T3), Frankfurt, Los Angeles, Singapore (Changi, T2), and Taipei. Australia has a number of lounges, in Sydney, Melbourne, and Perth. Naturally, you gain access to the lounges if you have a First or Business Class ticket. There is no access in Premium economy, or economy, unless you are an Enrich Platinum or Enrich Gold member. You can not buy your way in: there is no paid membership scheme, nor are 'daypasses' available. The lounges are of variable quality. Some of them are brand new, and very good - such as the new Heathrow lounge - however others aat outstations are decidedly tired. If you are an Enritch Platinum, look out of the Platinum Suite. It is a private lounge within the lounge: in effect it is an extra small room, but there is bulter service for food and drinks. If you are looking for the Malaysia Airlines Kuala Lumpur Lounge, there are actually three: Malaysia Airlines lounge locations are the Satellite Lounge, Domestic Lounge and the Regional Lounge. The Lounge in Kuala Lumpur is excellent but starting to look rather tatty; after all, it was rebuilt in 2005, and it is getting a little worn now. After taking the train to the main central rotunda of the international satellite, turn behind you, and take the lift or stairs upwards, to the large impressive lounge entrance, behind the urns and the hotel-foyer style entrance. One inside the lounge looks like a fairly dull airport lounge: it really isn't anything to rave about, under the classic swooping roof that supposedly resembles a Malay temple. There are racks and racks of shabby seats, all in two plus two around a coffee table. Sockets for laptops are hard to find. At the windows are 3+table seats, in a lighter shade of fake suede, although whoever specified suede for these lounges should be fired, as they are very tired. Seats near the window are better - at least they get a view! There are stark upright wooden chairs around the dining area at the far end: an area that wouldn't look out of place in Ikea, with wooden laminate floors and all. Food is a major disapointment in the lounge: there is little choice, and compared to the delights of Singapore or Thai lounges is pretty lousy, although if you are used to the 'delights' of American style lounges, it may seem like a haven. Whatever, the choice is limited for most of the day to sandwiches (under the plastic covers), pastries, nuts and crisps. In the morning there are packets of cerial, and crossants, plus a hot breakfast with chicken sausages. In the evening things are better, with a couple of curries in two hot tourines, plus two soups and fried rice and noodles. The bar is better, having a decent spirit selection: alas, its pretty poor for wine. There are some relatively slow computers in the lounge, connected to the internet. There are also showers; indeed, more than that, there is a sauna with a relaxation room, and massage chairs. Forget the tired and worn Business side: this is the place to be. 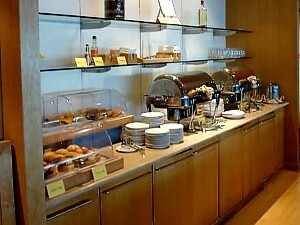 The Malaysia Airlines Satellite First Class lounge claims to be one of the best lounges worldwide. It is not, but doesn't half do a decent job. The lounge occupies the right hand side of the lounge complex, and it is a haven of peace compared to the Business section. There are plenty of works of art (in small illuminated alcoves), and fresh cut flowers, in the First side. There are large, squashy, arm chairs and sofa in racks of four seats around a coffee table, under giant palms in small pots here. What dominates it though is the fountain. Running the entire length of the lounge it is guaranteed to have you running to the bathroom. 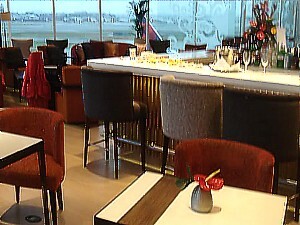 Malaysia Airlines claim that the elegant interior and fine dining is the signature of the lounge. And for once they are getting close: it contains a proper five star restaurant. The entrance, with it's sail cloth, is like something from the arabian knights; you'll be escorted to a table with waiter service. Food is very good here, with dishes on demand, or you can walk up to the buffet which has the usual sandwiches, and an impressive range of canapés. The bar is however a step below what you might expect, with just basic spirits including Black Label, Gordon's Gin (yep, they are being cheap) Baileys (not chilled) Tia Maria, Bacardi, Campari, Smirnoff (Red) VSOP and Drambuie. They are at least free pour, in a fancy wooden rack, and with lovely cut-glass tumblers. Magazines are on the strange U shaped magazine rack: if you love glossy titles with the words MBA, Inc, Corp, Biz or Fortune in the title you will be well at home. 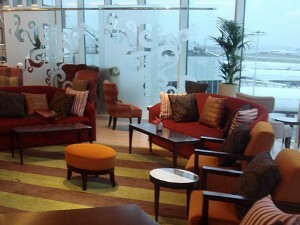 Malaysia Airlines has opened a brand new lounge at London Heathrow. It is right next to Gate 6, which MH generally use, making for only a short walk when the flights are called. Enter beside the Escada boutique next to the WH Smith newstand, then take the lift (or stairs) to level 3. There is a reception at the top, where there is also an odd panneled cupboard with gold padding: you can store your suitcase in here, although it is is a bit small for anything larger than a roll-aboard. To the right of reception is the small First lounge, while straight on in the main Business Class section. The Malaysia Airlines heathrow lounge opened in 2009, when Malaysian moved to Terminal 4, and it is richly decorated with artwork, and paintings. History buffs may note that MH got into trouble when it was discovered it had been buying paintings, some of which were worth MYR 3 million: and some are here on the walls. The lounge is spectatular: really really good, with a great hotel-lobby style atmosphere. There are a lot of comfy chairs, many overlooking the spectacular floor to ceiling windows with a great view of... Hounslow. Oddly, there is also a surplus of cushions here too: at least they are all clean and new. In the middle of the Malaysia Airlines business class lounge heathrow there is a heated buffet cabinet, with mixed asian and western dishes, from rice and noodles to sausage and mash. Even the snacks are good, with samosas, sandwiches, curry-puffs, pastries, cereals and fresh fruits. There is a great Bar. Alas, not free pour: instead there is a barman here, who mans both the Business Class and the First Class sections of the lounge: hence, although there is plentiful Moet you may have to wait quite a while to get a drink, however there is also another counter with a rack of spirit bottles, including Glenfidditch and Gordon's Gin. Down below in the mini-fridge there is beer with Carlsberg, Kronenberg and Tiger Beer. There are a few PCs in the lounge, a couple of TVs inset into the glass wall, and plenty of power points of computers. Newspapers are good, in a wooden folding cabinet by the window. There are most of the Malay papers, a Straits Times, and the Telegraph. There is a small glass wall that separates the First Class and the Business class section of the lounges: it's too high to leap over, however you can see through. In the First section there are much better high winged arm chairs, each one of which has its own PC overlooking the window but that is about it. There are also a couple of shower rooms, which are clean, swish, and modern. There are amenity kits in the showers. It's quite a surprise that there is still a Malaysia Airlines lounge in Melbourne. Alas, it is the size of a small sitting room, with very little choice of food and the same shabby seats as KUL but a very attentive service. The reception desk looks impressive, with a sweeping marble floor and downlighters creating a welcome arrival. And then you walk in to what is a very small room. There are six - count 'em! 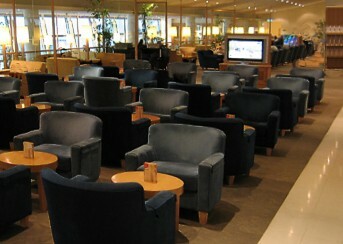 - armchairs in the middle of the room (who on earth specified fake suede for these lounges should be made to rethink!) and three more banks of two armchairs close to where you walk in. Finally there are three dining tables close to the bar. Food is really poor, with only sandwiches and nuts, plus cheese and crackers. 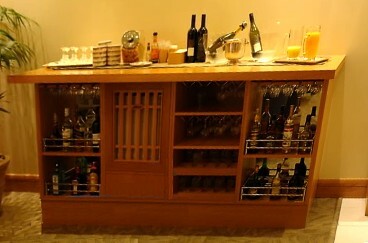 The bar isn't much better, with a small sideboard at the end of the lounge. Spirits are low down in the wooden rack, but at least there are 12 decent bottles. On the top of this there are two bottles of red, one of white, and a sparkling wine.